The Kind of Face You Hate: Blogathon Ahoy! Boy, it's been a while since we've had one of these, isn't it? Feels that way, at least. Maybe it's just that it's been so long since anybody bothered to tell me about one of these. Okay, I see how it is. But I'll get my revenge later. For now, it's important to focus on the topic at hand, which is a Nicholas Ray blogathon, hosted by the effervescent Tony Dayoub, of the great blog Cinema Viewfinder. Ray, as I'm sure you're all aware, was one of the giants of mid-century Hollywood filmmaking, and he is as worthy a subject for a blogathon as you'd imagine. So why don't you all take part? Head on over to Tony's place and read the details. You should know, though, that I plan on taking part in this one myself, so don't you go picking the movie I'm going to write about, or else I will punch you so hard. What?!!! 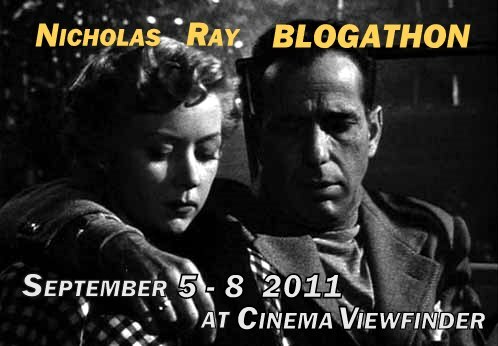 I'm having a Nicholas Ray blogathon on the same day! How embarrassing. Oh well, I might as well just scrap mine and do Tony's. In related news, one of the movie's I'm writing up for TCM's database is a Ray movie. So I could contribute to the blogathon with a movie article I was actually paid to write. That'd be a first for me. And it kills two birds with one stone. Wait...two birds with one stone? Is that even possible??? Thanks for the plug, Bill. Have you posted that article yet, Greg? Because among other sources, I've been using the TCM database extensively for my Ray pieces. A vicious circle I tell you. Tony - No, I haven't. I have a couple of deadlines on Monday and then a couple more on the 19th, not counting the Wednesday blogging duties (which is why Cinema Styles is a once a week gig these days). Now, when I send in a finished article it usually doesn't get posted for another couple of weeks so it won't be ready in time for the blogathon but I can put a different, more review oriented take up on Cinema Styles for the blogathon. The movie by the way is The True Story of Jesse James. Bill - Yes, it's possible but you need a little help from the birds. If they're standing in profile, with one bird's head directly behind the other and a solid concrete wall behind them, you can throw the stone hard enough into the first bird's head so it kills him, first, and then, with the force applied, pushes the second bird's head back, smashing it into the wall. So, yes, it's possible. I've now done it four times.